Monroeville NJ Real Estate Info is here to help you understand as much as possible about the area within Gloucester County, NJ. As in many other Townships within Gloucester County, we normally would use the School District of Monroeville to help identify all homes for sale within this particular area. However, as you will see below - it is split within Elk Township and Upper Pittsgrove Township. 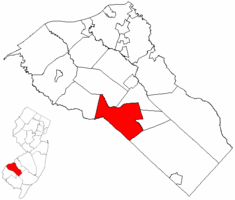 It gets even more confusing because Monroeville includes parts of Elk Township and Upper Pittsgrove Township of Salem County!